I found this poster at Zazzle.co.uk, it made me chuckle. Disclaimer: I am not endorsing this product in any way. Above is the new £61m research institute that is going to be build at the University of Manchester to study graphene. 60 organisations, including the Royal College of Paediatrics and Child Healthare are calling for a 20p-per-litre tax on soft drinks to be included in this year’s Budget. This could raise up to £1bn a year in duty, which could be used to fund free fruit and healthy meals in schools. The tax could drive people towards no added sugar drinks. A 330-millilitre can of sugary pop typically contains something like 35g of sugar, that is nine lumps. There are about 4 calories per gram of sugar, so that is 140 calories per can of sugary pop. The Guideline Daily Amount (GDA) for sugar is 90 grams. That is less than three cans of sugary pop, which is in “old money” is a pint and a half. I attended the winter school “From classical to quantum GR: applications to black holes” at the University of Sussex. The school was for three days over the 16th, 17th and 18th of January 2013. I posted a little about the event here. The slides of the lectures are now available here. Once again I thank Xavier Calmet for organising the winter school, which turned out to be very wintery indeed. The poster for the lecture can be found here (opens a PDF). Physicists in the Czech Republic have produced a simple example of an optical tractor beam using two laser beams . Interestingly, they have also discovered a new technique for sorting microscopic particles. We are not at the stage of lifting cows quite yet! I posted a little about tractor beams before here, which employ a Bessel beam. 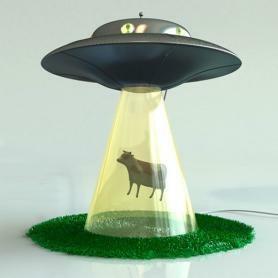 Prof David Grier at New York University, published a paper last year announcing that they have experimentally demonstrated such a class of tractor beams . The work of the physicists at the Institute of Scientific Instruments of the Academy of Sciences of the Czech Republic shows that a simpler version of a tractor beam is possible. Their tractor beam comprises of two laser beams brought to a focus with a lens, which can easily be done using a standard commercial microscope system. They found that by focusing the light inwards they could generate the same effect as if they had employed a Bessel beam. We are not the first to demonstrate experimentally the motion of particles in a beam where the intensity is homogeneous, but our method is a little bit simpler and more straightforward than previous efforts. An unexpected effect is that the particles are pushed or pulled by the laser light depending on both the size of the particles and the polarization of the light. This allowed the researchers to separate mixtures of two different sized particles by changing the polarisation of the light. The fact that the effect of the polarisation of lights is so prominent is surprising and for sure will lead to further research. The Mathematical Art Exhibition Award “for aesthetically pleasing works that combine mathematics and art” was established in 2008 through an endowment provided to the American Mathematical Society by an anonymous donor who wishes to acknowledge those whose works demonstrate the beauty and elegance of mathematics expressed in a visual art form. The awards are US$400 for Best photograph, painting, or print; $400 for Best textile, sculpture, or other medium; and $200 for Honorable Mention. 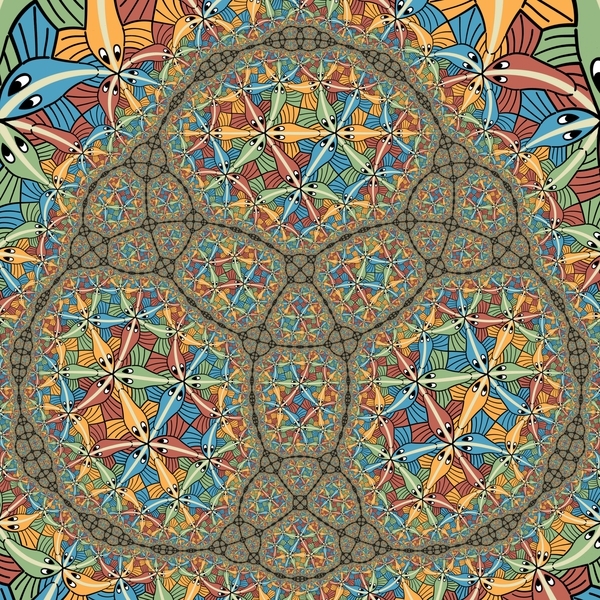 The Mathematical Art Exhibition of juried works in various media is held at the annual Joint Mathematics Meetings of the American Mathematical Society (AMS) and Mathematical Association of America (MAA). Here are the winners for this year. “Bended Circle Limit III,” by Vladimir Bulatov was awarded Best photograph, painting, or print. 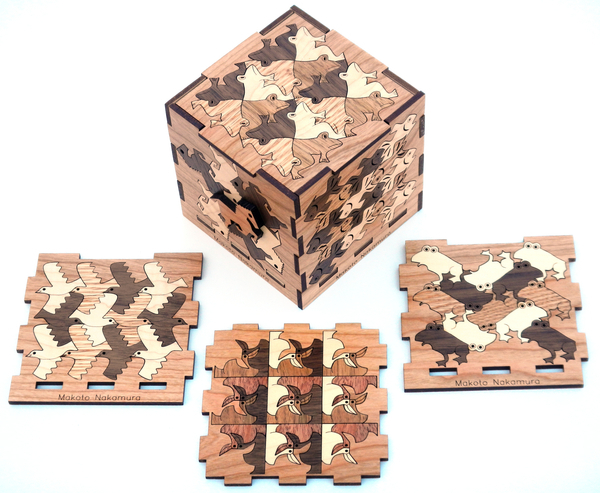 “Inlaid Wooden Boxes of Makoto Nakamura’s Tessellations,” by Kevin Lee, Normandale Community College, Saint Paul, MN, was awarded Best textile, sculpture, or other medium. “Tessellation Evolution,” by Susan Goldstine, St. Mary’s College of Maryland, received Honorable Mention. For larger pictures and further details follow the link below. I have a new preprint posted on the arXiv; “Odd Jacobi manifolds and Loday-Poisson brackets”. It is a continuation of my studies of odd Jacobi structures on supermanifolds. In this paper we construct a non-skewsymmetric version of a Poisson bracket on the algebra of smooth functions on an odd Jacobi supermanifold. We refer to such Poisson-like brackets as Loday-Poisson brackets. We examine the relations between the Hamiltonian vector fields with respect to both the odd Jacobi structure and the Loday-Poisson structure. Interestingly, these relations are identical to the Cartan identities. There are some subtle differences between even and odd structures and this preprint discusses one such difference. In particular, one can use the derived bracket formalism  to construct a Poisson-like bracket on the supermanifold mod the skewsymmetry. An odd Jacobi manifold is a supermanifold equipped with an almost Schouten structure and a homological vector field that satisfy some relations. The relations are not important for this discussion. See  for details. From this data one can construct an odd Jacobi bracket, that is an odd version of a Poisson bracket with a modified Leibniz rule. The adjoint operator is a first order differential operator as opposed to a vector field. Furthermore, by using the fact that the homological vector field is a Jacobi vector, that is it a “derivation over the odd Jacobi bracket” one can construct an even bracket using the derived bracket construction. The resulting bracket satisfies a version of the Jacobi identity, but is not skewsymmetric. It also satisfies the Leibniz rule (from the left). Lie brackets mod the skewsymmetry were first examined by Loday, and so I call Loday brackets + Leibniz rule “Loday-Poisson brackets”. This is in contrast to classical manifolds, where due to the work of Grabowski and Marmo , we know that the Jacobi identity and the Leibniz rule force the skewsymmetry. On supermanifolds we have nilpotent functions and this invalidates the assumptions of Grabowski and Marmo. Furthermore, on an even Jacobi supermanifold there is no canonical choice of homological vector field to use, if one exists at all. In the preprint I present several relations between the Hamiltonian vector fields with respect to the initial odd Jacobi structure and the derived Loday-Poisson structure. I note the similarity with the standard Cartan calculus. I have discussed the derived product on a Q-manifold here. As odd Jacobi manifolds come with a homological vector field as part of the structure, they are also Q-manifolds and have a derived product. Interestingly, the Loday-Poisson bracket not only satisfies the Leibniz rule (from the left) for the usual product of functions on a supermanifold, but also the derived product. That is we have a kind on non-skewsymmetric bracket that satisfies a version of the Jacobi identity and a version of the Leibniz rule over a Grassmann odd noncommutative form of multiplication. To my knowledge, these kinds of noncommutative Poisson algebras have not been studied. J. Grabowski and G. Marmo. Non-antisymmetric versions of Nambu-Poisson and Lie algebroid brackets. J. Phys. A: Math. Gen. 34 (2001), 3803–3809. Yvette Kosmann–Schwarzbach. Derived brackets. Lett. Math. 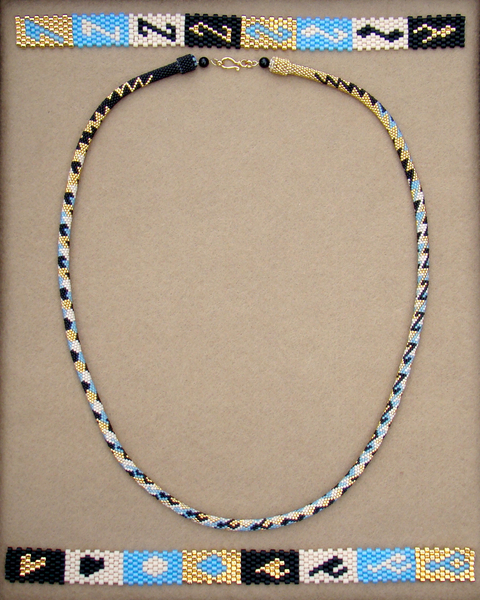 Phys., 69 (2004), 61-87. 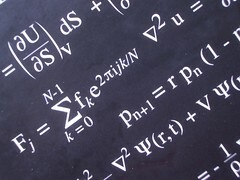 The London Mathematical Society Annual Review for 2011-2012 is available here (opens pdf). As a side remark, I am not actually a member, I must rectify that soon. The London Mathematical Society (LMS), founded in 1865, is the UK’s learned society for mathematics. The Society has as its purpose the advancement, dissemination and promotion of mathematical knowledge in the UK and worldwide. There is growing concern about the impact that reduced funding and support for postgraduate education, especially taught Masters Programmes, will have for the UK’s science and innovation base in terms of producing highly trained people that will have the skills and knowledge requisite for academic research and to meet the demanding needs of industry. We essentially have a system in place that is transferring the costs of postgraduate education to UK students which will have implications for the participation levels of UK-domiciled students.